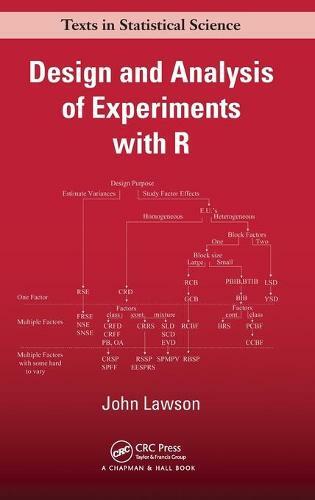 Design and Analysis of Experiments with R presents a unified treatment of experimental designs and design concepts commonly used in practice. It connects the objectives of research to the type of experimental design required, describes the process of creating the design and collecting the data, shows how to perform the proper analysis of the data, and illustrates the interpretation of results. The book emphasizes the connection among the experimental units, the way treatments are randomized to experimental units, and the proper error term for data analysis. R code is used to create and analyze all the example experiments. The code examples from the text are available for download on the author's website, enabling students to duplicate all the designs and data analysis. Intended for a one-semester or two-quarter course on experimental design, this text covers classical ideas in experimental design as well as the latest research topics. It gives students practical guidance on using R to analyze experimental data. "This is an excellent but demanding text. ... This book should be mandatory reading for anyone teaching a course in the statistical design of experiments. ... reading this text is likely to influence their course for the better." "In my opinion, this is a very valuable book. It covers the topics that I judge should be in such a book including what might be called the standard designs and more ... it has become my go to text on experimental design."